Duracell vs Energizer 9 volt battery. 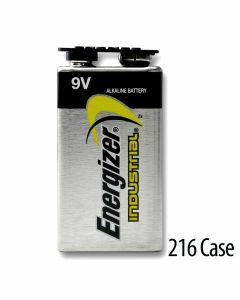 Are all 9V batteries the same? 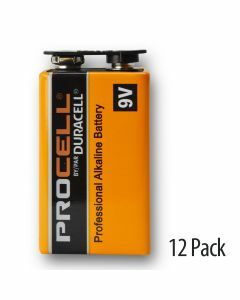 No, unfortunately there are very small differences in size of 9 volt batteries, even in brand name 9v batteries such as Energizer (or Energizer Industrial) and Duracell (or Duracell Procell). This plays a significant role in 9v batteries fitting properly into a device. 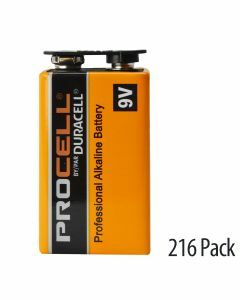 Most people do not realize there may be a difference in 9 volt battery size. It is difficult to tell just by looking at the 9v battery. For example, the Energizer 9 volt battery is approximately 1/16” taller than the Duracell Procell 9 Volt battery. There are indeed ‘battery standards’ for battery manufacturers to follow. The dimensions for 9 volt batteries are H 48 mm × L 25 mm × W 15 mm (1.9 in × 1 in × 0.6 in). However these standards still allow for varying in size for a 9 volt battery. The maximum size permitted, for example, is 48.5 mm × 26.5 mm × 17.5 mm. The result - electronic devices are not always designed with excess space in the battery cavity, resulting in cavity design that will not accept 9 volt batteries of all manufacturers. Many of the cheaper, no brand name 9 Volt batteries, for example, are too wide for electronic devices. 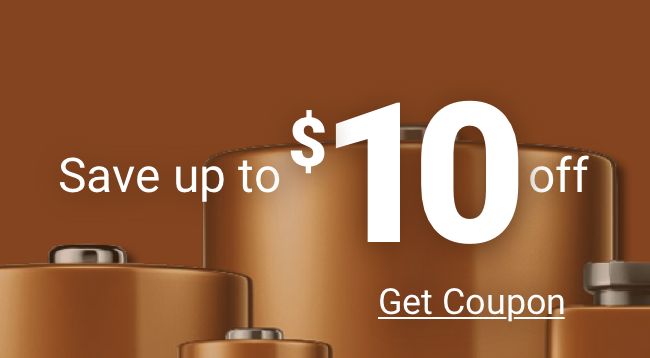 Cheaper batteries are almost always too wide because it allows manufacturers to get away with using less expensive materials. 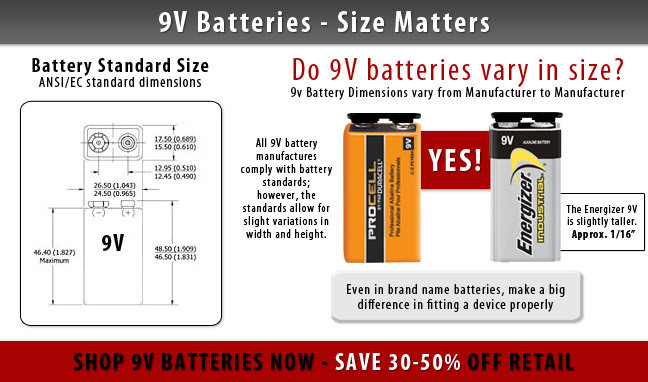 How do you decide which 9 volt battery is right for your device? Duracell vs Energizer 9 Volt? A correctly fitting 9v battery should just drop in the holder. 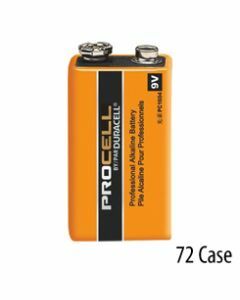 Your best bet - check your device manufacturer’s recommendation for correctly fitting 9v batteries or call Medic Batteries, we’ll be happy to help.